Uninterrupted time is a luxury - make the most of it. Plan a week's worth of family favorites on the grill. You're just a sliding door away from the sound of the surf and seagulls. There's nothing else like it. Kick off your shoes the second you hit the sand. Overdid it in the sun? Escape to the indoor pool and hot tub for a day or two. Knock it out first thing so you don't miss a minute of beach time. 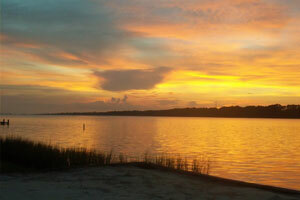 Located on beautiful white-sand Orange Beach. Orange Beach Golf Center is an 8 minute drive away. First things first. Line up lounger and umbrella rentals and set up camp for morning-to-night days on the beach during your sand-and-surf stay at Tidewater. Put your semi-pro packing skills to good use and load up the beach bags with sand toys and snorkel gear, snacks and sunscreen. (No worries if you forgot something – it’s an easy dash to the condo and back.) Vacation is the time you say yes to requests that might normally get a no, like sleeping in late and popsicles before lunch. Separate bedrooms, fully equipped kitchens and balconies (for popsicle drips) make it even easier. For dinner, appoint a grill-master and feast Gulf-front. Then head back up for movie night, tucking the little ones in early so they’re ready for go-karts and bumper boats at Adventure Island or the massive slides at Waterville the next day. - The front desk is open 8:00 AM - 8:00 PM daily. Check-in for this property is based at a different location, 1557 Gulf Shores Parkway (Highway 59), Gulf Shores, Alabama, 36542, approximately 8.8 miles (14.2 kilometers) from the resort. For more details please contact the property using information on the booking confirmation. The individual making the reservation must be 25 years of age or older and must occupy the rental property the entire term of the reservation. Singles under 25 are prohibited unless accompanied by a parent or legal guardian. Go deep-sea fishing or take part in a dolphin cruise. Visit Adventure Island amusement park for family fun including laser tag, bumper boats and kiddie rides for children as young as age five. Don’t forget to take a ride on the 112 foot tall Ferris Wheel at The Wharf.